Sacrifice On the Steppe: The Italian Alpine Corps in the Stalingrad Campaign, 1942-1943 - Jimmie Aaron Kepler, Ed.D. As a lifelong history buff, military history enthusiast, former US Army officer and holder of a BA degree in history, I find myself pleasantly surprised from time to time when I encounter a book that fills a void in my historical education. 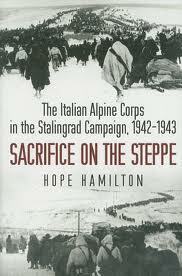 “Sacrifice On The Steppe: The Italian Alpine Corps in the Stalingrad Campaign, 1942-1943” written by Hope Hamilton and published by Casemate is one such book. The idea for the book originated when the author listened to her uncles’ reflections of his participation in World War II. Hope Hamilton’s book draws on personal interviews, exhaustive research and the written accounts of Italians who participated in and survived Mussolini’s tragic decision of Italian involvement. Mussolini compounded his mistake by sending even more troops the following year. The author does a good job of showing the human side of the Italian involvement on the Russian front. This is not a scholarly work on the tactics and logistics of the Italian involvement. Rather, it is the story of the people who made the terrible trek from Italy to Russia to support their German ally. The German’s had little trust of and kept the Italians minimally informed and I believe misused the Alpine troops by not maximizing the troops mountain fighting ability by their placement along the Don River. The author does a great job of telling the soldier’s story. Her writing style focuses on the individual accounts of the soldiers. She discusses how the Alpine Corps was caught up in the German campaign capture Stalingrad in the autumn of 1942. She takes us through the Soviet offensive that followed in late November. We experience the collapse of the entire Axis front and the Alpine Corps’ withdrawal to the Don. I could have used a more background about the Stalingrad Campaign. The book does not take a strategic view of the campaign. Little attention is given to the big picture. The story is told from the Italian point of view instead of looking at it from the Axis point of view. The book includes good notes, is well indexed, and has a great bibliography. I enjoyed the book. If you are looking for an after action report of the Italian participation or a critical analysis of the campaign this is not the book for you. If you’re looking for a good overview and an understanding of what the Italian soldiers experienced then you’ll enjoy the book. I give it four stars. It is a must addition to any military historian’s library. It is a good first volume to fill a long void of an English language account of the Italian involvement on the eastern front.